A technology transfer project realized for the international exhibition From Petra to Shawbak: archeology of a frontier. 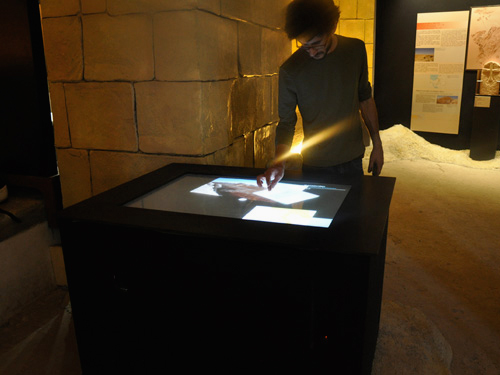 A multi-touch tableTop was realized for this exhibition that presents the results of the latest international archeology investigations and of the research conducted by the archaeological mission of the University of Florence in these past twenty years in Jordan at the sites of Petra and Shawbak, one of the most important historical areas in the world. Natural interface realized for the international exhibition "From Petra to Shawbak"
The exhibition itinerary has been conceived in three sections: 1) the discovery of an authentic capital that reinterprets the Crusader presence of the Seigniory of Transjordan, and begins a succession that crosses the dynasty of Saladin and reaches us; 2) the documentation of the diverse role performed by the frontier as a historical key of interpretation: from the ancient age (Nabataean, Roman, Byzantine), Arab-Islamic (Umayyad, Abbasid, Fatimid) up to the Crusader-Ayyubid and Mameluke ages, explored through the archaeological observatory of the region and of the sites of Petra and Shawbak; 3) the collection and “publication” of visitors’ comments. The interface design was built on the initial definition of the Information Architecture, based on the contents that the archaelogical research unit intended to deliver during the exhibition. It appeared immediately evident that all the contents available were related to two different dimensions: the time period and the definition level. The different level of resolution, or zoom detail, through which the territory can be explored are five as well: “Transjordan” region, “Shawbak” castle, “The fortified gate”, “Masonries” elevations, and “Stones”. Contents are made of videos, pictures and texts that show and explain the archaeological site for each of the described time span and zoom level. This entry was posted in Natural interaction, Transfer projects and tagged archeology, multi-touch, natural interfaces, Shawbak, tableTop on March 25, 2010 by admin.